← The EdTech Survivalist has been hacked! The following questions come from an email conversation Shawn Miller and I had about the genesis and guiding logic of UMW Blogs. Shawn is a member of Duke University’s Center for Instructional Technology, and the group is interested in hearing more about the ways we are using blogs here at Mary Washington. If all goes well an edited version of this post will also be published on the CIT blog as a way of introducing the means and methods behind UMW Blogs to the Duke campus. Pretty groovy! Tell us about UMW blogs (brief overview) – when? what was the decision process? 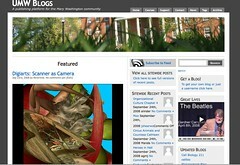 UMW Blogs is quite simply a web-based publishing platform for the Mary Washington academic community. The distinction between a blog and a more loosely defined publishing platform is actually important because while some people on UMW Blogs use it for what is commonly thought of as blogging, many more use it for a wide range of purposes that often don’t quite match the underlining logic of a blog (see here for a number of examples). So to call it a series of blogs in many ways doesn’t capture the more complex reality, it’s more akin to a dynamic online publishing space for students, staff, and faculty alike. The official birth date of UMW Blogs is August 27th, 2007, but unlike Athena it didn’t just jump from the head of Zeus one day. It came out of numerous iteration cycles with a variety of free and open source applications. It was born out of a culture of experimentation at UMW more generally, and the Division of Teaching and Learning Technologies (DTLT) specifically. The defining experiment was Gardner Campbell’s choice to get all the instructional technologists external web hosting accounts so they could rapidly test and develop several different, emerging open source applications such as MediaWiki, WordPress, Drupal, etc. In short, a sandbox approach to exploring educational technologies (you can hear Gardner explain this in three minutes here or a more lengthy presentation by the DTLT group here). Moreover, this approach embraced the best tools already freely available on the web (which were not necessarily limited to open source solutions) for sharing videos, images, bookmarks, and documents such as YouTube, Flickr, and delicious, and Writely (which is now Google Docs). I think the driving logic behind the experiment—and Gardner, Martha Burtis, Jerry Slezak, Andy Rush, and Patrick Murray-John can all correct me if I am wrong—was to imagine what takes place in the classroom at a university as not external to what was happening already on the wide open web more generally, but rather in constant dialogue with the conversations and resources that already exist out on the web. And by exploring this avenue more fully, the experience in the classroom could only be augmented by the networked approach of thinking and sharing openly on the web. The move towards openness with these Web 2.0 tools at UMW was not so much premised on a pre-determined ideological impetus, but a push for developing the best framework for sharing resources and publishing easily on the web for an entire intellectual community. In many ways openness comes as a serendipitous extension of such a framework, illustrating the point that the architecture of most Course Management Systems (and university websites more generally) are built upon a vision of controlling an image and locking down ideas rather than sharing and opening them up to the world at large. Openness is as much a function of design as it is of any set of beliefs. One might truly desire to be open, but have no means through the web-based publishing tools provided by their campus’s IT department to truly enable the kind of access requisite for allowing others to both find and re-purpose their work and ideas easily–kind of like what Emmanuel Wallerstein says about the impossibility of being a communist in world system controlled and dominated by capitalism. UMW Blogs is one of many project to come out of the process outlined above, and it certainly is not the end of the road. The group vision was, and still is, to enable the UMW community to take control of and manage their own work, identities and spaces online. One of the things we really like about UMW Blogs is that it allows people throughout the community to take ownership of their work, they control their space to some great extent. For example, they can use their blogs for personal reflection, to frame an eportfolio (here’s a nice student example), they can delete their own work at will, and export their data on the fly and re-import it to their own space or a commercial blogging system like Blogger or WordPress.com. Moreover, the syndicated framework we are using allows instructors and students who are using external applications to easily add their RSS feeds to UMW Blogs so that their work can become part of the searchable and discoverable flow of data. That is the key, don’t try and create a space that locks anyone in to one university tool, rather build a system that can, to quote Whitman, “contain multitudes.” This idea of empowering the community with their own tools for framing the work they do during their time at UMW epitomizes DTLT’s approach to instructional technologies (and approach not unique to us, and heavily influenced early on by many, many others around the internet such as Alan Levine, Bryan Alexander, Barbara Ganley, Stephen Downes, Brian Lamb, Laura Blankenship, and D’Arcy Norman, to name just a few). One practice that has highlighted the importance of managing and developing your voice online has been UMW Blogs’ ability to integrate all the individual threads into a larger, syndicated (or is it syncopated?) chorus of learning on campus. UMW Blogs has brought us closer to that vision than we have been heretofore, but there is still a ways to go. Nonetheless, after three years of one-off WordPress blogs and MediaWiki installations, the move towards a larger, integrated campus-wide publishing platform was as much a necessity as it is an ongoing experiment. -Does UMW blogs take the place of a standard LMS for UMW? No, it doesn’t replace our standard Learning Management System (LMS) which is BlackBoard Basic. UMW Blogs is not a mandate from the administration. In fact, we’re still trying to make sure everyone knows it’s very much an experimental space. Despite this fact, the interest has been so great that it has become a de facto enterprise system simply based on numbers: we currently have 1954 users on campus (out of a population of roughly 4,000), and more than 1800 blogs. Those numbers are far more than the 100 or 200 blogs we were hoping for last fall. The growth has been phenomenal and much of that might be because the system is not mandated, nor is it cordoned off for a special few. Such facts have no small impact on the community that uses UMW Blogs. It’s active, variegated, experimental, and highly entertaining. Over the last 12 months over 75 UMW faculty have signed up for UMW Blogs, and almost 100 courses have used (or are currently using) this publishing platform in some fashion. And I stress some fashion for often no two courses use it the same exact way, much like the fact that no two professors teach in the same exact way. For example, Dr. Gardner Campbell’s Milton Seminar this Summer has pushed the limits by allowing them to use their own blogs, and pulling (or feeding) their work into a central aggregated course blog. Professor Steve Greenlaw’s freshman seminar on Globalization is an excellent example of a distributed course site using all kinds of tools like WordPress.com, Flickr, delicious, and YouTube. Professor Mara Scanlon Asian American Literature course blog used the space as a space where students could choose where they did the work, and built the course resources (such as a syllabus, assignments, etc.) around the active blog space. 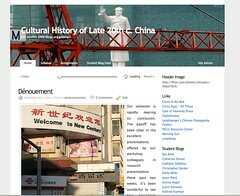 Professor Sue Fernsebner’s Cultural History of Late 20th Century China provides a centralized course space for the professor to publish announcements and reading questions while at the same time providing pages for tracking all the students’ research blogs. Professor John Morello has used the space for his speech course to allow his class to share and comment on each others video-taped speeches. Our provost, Nina Mikhalevsky, has been using UMW Blogs for two of her course sites, both for sharing course materials and creating dynamic, media-rich forums via the blog posts. Additionally, Professor Steven Gallik is using UMW Blogs as a series of student laboratory notebooks for his Cell Biology course, harnessing the power of syndication for his Online Laboratory suite (find out more about this project here). It cannot integrate into Banner and other institutional data systems. It cannot provide pre-populated lists of students and courses for professors. It does not have a testing/quizzing module, nor do you have a grade book. The logic behind UMW Blogs is a loosely coupled system that gives the community the ability to publish and share online, it is not (nor do we necessarily believe it should be) contorted to meet the the administrative concerns that are often better dealt with by course management systems. Let’s face it, learning management systems are seldom about learning, and primarily deal with administrative overhead. And that’s fine, but for really powerful and compelling examples of learning, LMSs are probably the last place one would look online if, indeed, one could look at all. Finally, in terms of the hosting and administration of UMW Blogs, it is hosted off campus and for the first year it was on a shared server and cost us $30 a month. This year we have it on an externally hosted dedicated server with nightly backups to an alternate site and it currently costs us about $400 a month. And if a campus wanted to offload the hosting and maintanence entirely, James Farmer’s EduBlogs Campus might be an excellent, cost-effective alternative. The cost of any campus publishing endeavor like this should be far more in terms of people working with the faculty and students for imagining ways of using these tools rather than infrastructure and administrative overhead. I think such a model makes a strong case for a cost effective and sustainable model in these troubled economic times! -What sort of faculty have been interested in participating? Feel free to hit us with some stats. In many ways the range of faculty has been interesting. It isn’t simply the case that the most tech savvy folks are using UMW Blogs, as is often the reality with new media. Rather, it has attracted those faculty who want to do something online, and want it to be both simple and aesthetically pleasing. This is where such a system has become a tremendous asset for the professors. It is often no harder than writing an email, and the ability for them to maintain full control over their space and make it look the way they want has made it very appealing to a wide range of people. This includes working committees, staff organizations, student organizations, and faculty who want to create online resources for their professional presentations and research. It has offered a low-threshold entry point for many who have been previously uncomfortable with the web, while providing the room for experimentation and customization that keeps those who understand the web intimately continually intrigued and engaged. Want some stats? Check out a previous post of mine that offers some insight from the beginning of September about overall site usage, posts, comments, etc. -What have the general faculty and student reactions been? So far, the reviews have been rather favorable, and the number of people using it might be one indication of this. The dialogue around the tool is wide open, and we are constantly getting feedback about tweaking things and ironing out some interface issues. But most of the conversations center around how to further push the limits of using this space for teaching and learning, which might suggest we have gotten beyond the question of whether or not it’s functional and onto the issues of how we can make it even better as a space for syndicating the amazing stuff happening around campus. -Since many (all?) the blogs are public, how do you deal with privacy concerns? Along that same thread – have any of the blogs received ‘outside’ attention/feedback/collaboration? Making blogs public or not is determined on a case-by-case basis by the user. Not everything published on UMW Blogs is open, and every person controls the extent to which others sees what they create. This is essential to the logic of such a system. We wanted to put as much responsibility and control in the hands of those managing their own space as possible. The logic behind the model is that someone who wants to share their work freely can do so as easily as someone who wants to control who sees their work. What is radical about this is the idea of choice built into the system, the ability of controlling permissions and access in LMSs and CMSs is often far more difficult than it should be, and emphasizes just how they were designed around the logic of control and administrative management rather than openness and sharing. Claudia Emerson’s Literary Journals projects that provides students the ability to envision, solicit entries and create a web-based literary journal over the course of a semester. If you followed any of the links above, you may have noticed that many of these sites are not blogs at all, but dynamic websites for publishing research, media, and creative works for the world at large. -In terms of using blogs (and in this case WordPress) is the main thing the platform (ie: WordPress makes so many things possible) or the concept (ie: blogs have a flexible nature to them)? The application we are using, WordPress Multi-User, is indeed a blogging engine, but we have found its open-ended possibilities and simplicity make it far more. It’s a highly flexible and accessible platform that the UMW community can use for anything from publishing dynamic personal web pages to managing courses, or sharing audio and video on the fly to framing eportfolios. So, its ease-of-use and built-in syndication works well for what we are trying to accomplish, and hence was the tools of choice. All that said, the concept of an open and flexible syndicated publishing platform is far more important than any one application. Moreover, the willingness of faculty and students to experiment has been the key element for something like UMW Blogs to garner the impressive response and buy-in we have had over the past year. -What sort of plugins/extras/widgets (RSS feeds, Flickr widgets, special help with themes) does your department and/or others at UMW provide? This is a tough one to answer because we have so many plugins, widgets and themes (I can give you an idea, but an exhaustive list might well be impossible). Our method for themes and plugins is that we basically test themes and plugins before we add them to the system to make sure they don’t crash our installation. We are open to people in the community requesting both themes and plugins if they need more functionality or a different layout. Our group either helps them find it (often when we are working with a specific professor who expresses a particular need), or we take the larger communities requests and recommendations and test them out to make sure there are no issues. Part of the genius of this system is that additional functionality comes at no extra cost. More importantly, such a system encourages faculty and students to explore the framework and think about what they would like to see and go out and find it. In that very act there is a different relationship to how you frame the educational experience online. For a list of regular plugins we offer on UMW Blogs see this post, for WordPress Multi-User specific plugins see this post (which is generally accurate, but a bit outdated now), and for a list of the themes (although not an exhaustive list) see James Farmer’s Farms 100 Big Ones Theme Pack for WPMu. This entry was posted in experimenting, UMW Blogs, wordpress multi-user, wpmu and tagged instructional technology, UMW Blogs, umwblogs, wpmu, wpmued. Bookmark the permalink. Once again, you’ve done the educational blogging community a great service by your careful and thorough reflection on what you’ve accomplished at UMW. Thanks, Jim, for continuing to share your wisdom and enthusiasm with the rest of us. Thanks a lot for your kind words, especially since you are an integral part of this story. It was you who gave Gardner the idea to explore externally hosted webspace for experimenting with these open source applications. So, thank you, your comment here brings the point that such a project was built on the ideas and sweat of many people outside the UMW community as well.